I was a little on the late side making it down to the The Cinnamon Club to be met by a packed house for the Strathclyde University Big Band featuring guest star Mike Walker. Very glad I did too, as it was a fab night with a great buzz. The second set kicked off with a personal fave, the perennial classic 'Maiden Voyage'. I thought the horn arrangements on this one slightly odd, but it featured a kicking solo from the ever reliable Mr Walker, and got the set off to a driving start. The funky 'Chameleon' was delivered with panache, the dual guitar attack of guitarist Nigel Chadwick and Mike Walker giving the tune a swaggering kick. Nigel treated us to a tasty overdriven solo that Mike picked up and rounded off with gusto. 'Work song' was another hard swinging treat, the rich and punchy horn lines hitting the spot nicely. The dusky tones of vocalist Stephanie Lawrence were a great addition to some vocal led tracks that went down especially well with the club lounge audience I felt. 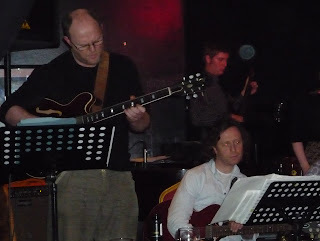 After the big band set, Nige Chadwick invited us local jazzers to an after hours jam, so I joined in along with Jamie Saffers, Frank Le Bass, Bennet Longman and a few of the horn players fom the big band. It was a tad rough at the edges, a beer or two having dimmed the brain cells somewhat, but I think we knocked out a half decent version of 'All The Things You Are'. All in all it was a great night and I'm sure owner Neil Hughes will have been well chuffed with how it went.